Our little dude is now at that age where everything needs explaining no matter where we are or when the question arises. We’ve discussed what Tyrannosauruses like to eat over breakfast, had conversations about why I will never be growing a willy whilst in a public toilet and have started to explore explaining what gay means. In M’s world having two mums is just the norm, in fact it’s such a none issue at the moment that he gets dismissive when we start to discuss how much he likes having mums and about his friends that have dads or are raised by their grans. When we used to say that he had two mummies he was adamant he didn’t, “I have a Mama and a Mummy, one mummy, one Mama”. Now he gets it, people whom are not aware he calls me Mama often refer to us as his mummies. He accepts now that people groups us together under the mummy umbrella and he is ok with the assumption. Because we are his two mums, one day he will drop the Mama and I will be mum just like C is every now and then. With M starting school we were aware that the word gay may start to enter his world more frequently. We have used the word in conversation around him, but to be honest it’s not the most frequent word we use as we don’t tend to have conversations about being gay around M, not for any reason, just because we just are who we are, we never have a need to discuss it. It first came up properly when we talked about gay pride and how both Clara and I are gay. It was then that I realised it is not the easiest thing to teach a 4 year old a new word and meaning behind it, when it can mean so much. We tried explaining what gay means by saying that both Clara and I love each other and are girls which means we like to say we are gay due to whom we love. Which got confusing as he then started asking if he had friends that were boys he loved, would that mean he is gay. This lead to discussing how there are different types of love which can get VERY confusing when you are four, but he did grasp that his love for his friends was different to the love for his Mummy, Mama, Nanny or his Pokemon figures. 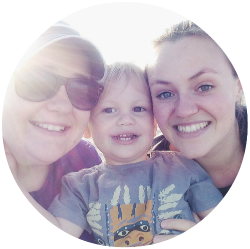 I started to explain that we can love boys or girls, but Clara and I were born to love girls and he will know one day if he loves girls, boys or both, but there is no need to dwell on it as we will always be there for him if this feels confusing. We have a very open door policy in our family and will make sure M can talk to us without fear of us being shocked or embarrassed by his questions. We know there will be more questions as he grows and starts to understand feelings and emotions, but until then we will keep the words we use age-appropriate. So my best advice for explaining what gay means to a child is to answer them the best way possible relevant to their age, don’t dismiss their question in fear you will “make them gay” and don’t leave it to them to discover faulty information that could potentially be homophobic explanations. Kids are very matter of fact and if they feel safe enough to ask you what gay means that is great, use it to show your child you are there when they have tricky questions or need to talk to you when they don’t understand things in their world. This! Addison asks everything and someone had said to her at school about Gay, she turned round to them and said “Mummies best friends are Gay and so is Uncle Max”. She thankfully was not hurt by a not so nice comment to follow but did ask me all about it. Like I have explained to her it doesn’t matter who you love it is only that you love and you are kind and she agreed, although she did say she is not sure she believes her Uncle is gay as he has never had a boyfriend lol. I agree it has to be age appropriate, my daughter is 8 and understands it to mean being in love / being attracted to people of the same gender as you. At the moment, the idea of being in love with ANYONE regardless of gender makes her giggle and go shy so hetrosexual, bi or gay she just raises an eyebrow and goes back to whatever she was playing. Sounds like you’re there in the right way answering his questions. N asks lots too about everything, and I just try and be honest. He doesn’t know the word gay, but a boy in his class has 2 mums. He’d already asked how babies are made so I’d told him about eggs and sperms coming together, and how women make eggs and men make sperm. But then a few days later he asked how the little boy was made. That was certainly a question I didn’t expect to be answering to a 5 year old. I had to explain the various different methods 2 mums could have a baby, but that I didn’t know how his classmate had been made. But that it was for him to tell people later if he wanted to, that it was his business. I think children are accepting at this age, it’s just a case of fact for them.